As the traffic increased on the A23 the former road layout at Five Cross Ways, Warninglid became unable to cope without some improvements. Thus, in 1953 work was carried out to reduce the height of the southbound carriageway to equal that of the northbound and generally improve traffic flow. Alas, it turned out to be only a temporary fix, and with further increased traffic and the opening of the M23 significant more improvements were required. Since then, roadworks have taken place in various stages, including, of course, the construction of the bridge. Over the ensuing 60 years the Five Cross Ways junction has become completely unrecognisable from those early post-war years. See picture #872, picture #873, picture #874, and picture #1232. The Large Version shows the complete newspaper cutting. Some of the text is missing. 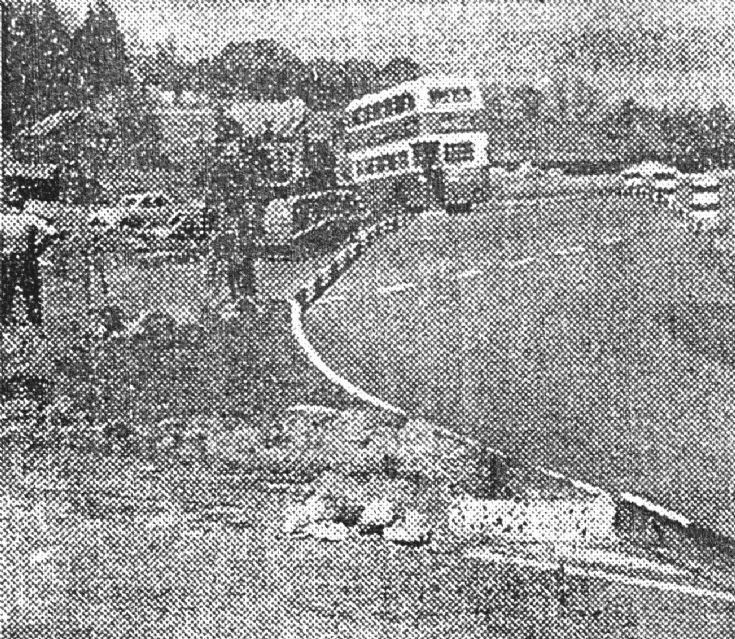 I suspect the Southdown bus is the No.89 which I sometimes used to catch in the 1950s. Its route was Horsham – Lower Beeding – Warninglid - Slough Green – Cuckfield – Haywards Heath.